The only person that can stop Rob Gronkowski is Rob Gronkowski. After years of injury issues, Gronk retired in 2019. However, he was nearly unstoppable in his prime and Rob Gronkowski rookie cards are already among the most popular of any tight end in the hobby. 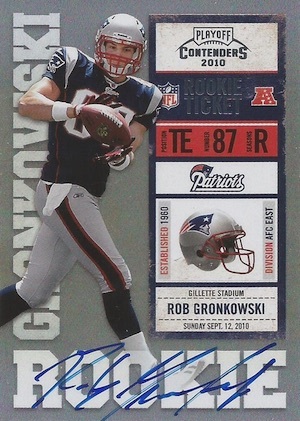 When it comes to Rob Gronkowski's earliest cards, there are plenty of choices available, including over 30 official rookie cards in 2010 products. The 13 autographed rookies from Topps and Panini are the top options and there are also some popular cards from Upper Deck which feature a college theme. 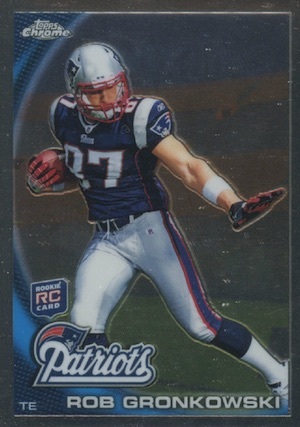 Shop for Rob Gronkowski cards on eBay. The full Rob Gronkowski rookie card checklist is available below. 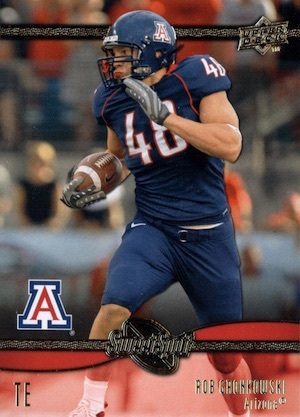 We also dig deeper into the selection with the Top Rob Gronkowski rookie card list. Click on the listings below to shop for cards on eBay. ROB GRONKOWSKI 2010 GRIDIRON GEMS ROOKIE GAME JERSEY AUTOGRAPH 164 -PATRIOTS!!! ROB GRONKOWSKI 2010 GRIDIRON GEMS ROOKIE 3 COLOR PATCH #12 50 -PATRIOTS!! !